Date Added: Wednesday 07 September, 2016 by Sean W.
I was looking for a custom suit to pay homage to Prince, and Indy exceeded my expectations in every way. From the ease of working with him, to the unrivaled quality of the finished productâ€¦.nothing could have gone better. The fit is amazing (truly!) and I canâ€™t wait until for its first outing! Check it out at: https://www.icloud.com/sharedalbum/#B0OGFssfGGIstOH.. Date Added: Tuesday 01 December, 2009 by Tom M.
Indy was very accomodating to my requests. I asked for a 1930's style blue pinstripe suit along with the Gittes shirt also on this site for my friends wedding. Indy showed me several fabrics which I loved and took note of all my specific style requests, of which there were pages! He even allowed alterations to the order to be made quite far down the line. Everything arrived promptly and well within time to take the suit for any alterations (though in the end no alterations were necessary, as the fit was exactly to my measurements - I've never had a suit fit so well). Advice from me would be to make your armhole measurements as tight as possible - I did and the jacket fits me literally like a shirt, and is incredibly comfortable as a result, unlike modern jackets with armholes that make you look like you have wings. Priority ordering and shipping is well worth the extra cost if you simply *must* have your item arrive by a specific date. The cloth was only the basic wool blend, howeer it's of a much higher quality than 99% of what I see in stores now; a good weight, soft yet firm, and most importantly very comfortable to wear while looking smart. The shirt is one of the most comfortable, well fitting and warm I've ever worn. It's also incredibly easy to keep clean and iron, as is the suit - I hung it up after taking it out of the packaging, and the creases just fell out of it. When the day finally came, most of the people there weren't even wearing jackets never mind ties; yet I didn't even feel overdressed for the simple reason that I was comfortable in what I was wearing due to the exceptional fit and style of Indy's clothes. I'd gladly recommend him to anyone (and in fact already have). Thanks!.. Date Added: Monday 15 June, 2009 by Shane L.
Date Added: Tuesday 27 January, 2009 by Jon M.
Date Added: Tuesday 08 July, 2008 by Adam T.
I had Indy make me up a 3 piece 1940s suit modeled after the one Humphrey Bogart wore in The Maltese Falcon (the one with the pinstripes). I had my measurements taken at my local tailor, and sent them off. 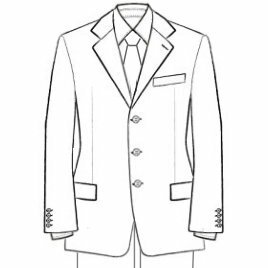 I had specific requests such as jacket buttons that actually button and unbutton, as well as a 1 inch cuff and a high rise to the trousers. I received the suit yesterday, and I swear a pair of gloves couldnt fit my hands as well as this suit fits me! What a brilliant job! The whole process took exactly 1 month including shipping and I couldnt be happier. Well done and highly recommended! -Adam.. Date Added: Saturday 20 October, 2007 by Bjorn P.